The producers traveled one last time to El Paso to cover the finishing touches on the reinstallation of the Plaza's original theatre pipe organ. 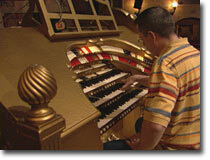 During this shoot, organ restorationist Grahame Davis supervised the tuning of the grand old Wurlitzer, making a myriad of adjustments to the maze of pipes that make up this one-of-a kind instrument. The organ has also been fitted to a lift that will allow it to rise during performances from below stage level and reveal itself to the audience, just as it did in the heyday of vaudeville and silent movies.